Our heavy-duty large S hooks are a simple and economical solution for organizing your worksite tool room, work bench and supply area. Organizing storage areas with large S hooks not only helps you meet basic housekeeping requirements on your job site but also increases productivity. Housekeeping is not just keeping things clean; it’s also keeping work areas neat and orderly and of course, free from trip hazards – a safer environment! Large S Hooks create a place for tools and supplies to be properly stored, hung up and off of the floor, away from walk ways. Hanging tools and rigging from our large S hook makes for a more effective use of space and easier access to tools and supplies. Getting organized improves productivity as tools and supplies are more quickly accessed, and after use, put away properly. Our 12” extra-large S hook, SW1275, is the perfect size for hanging, slings, hard hats, cables and rigging in your worksite storage area. 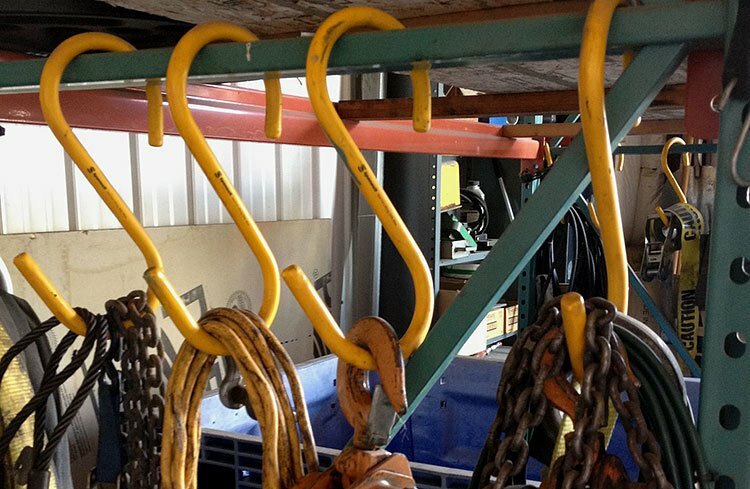 S hooks can be hung just about anywhere you need to hang hoses, coiled welding lead, electric cables and air hose. Our industrial S hooks look like large plastic S Hooks but they’re actually made of solid aluminum on the inside and coated with a heavy-duty, safety yellow, poly vinyl coating (PVC) which makes Spanwell’s S Hooks non-conductive. The PVC coating won’t mar other surfaces either. You can buy large S hooks from our online store as individual hooks or for better pricing, in boxes of 25.